The largest memorial in Salisbury National Cemetery, the Federal Monument was built to honor the unknown dead of Salisbury prison. Paid for in 1873 the monument had the incredibly high claim of 11,700 dead which was done without accurate archaeology or historical scholarship. 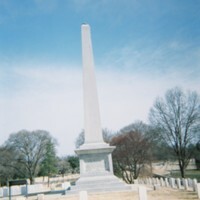 Nathan Johnson, Federal Monument, Salisbury National Cemetery, Civil War Era NC, accessed April 24, 2019, https://cwnc.omeka.chass.ncsu.edu/items/show/879.